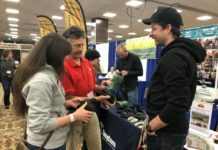 If you have been following my previous posts, you know that I like to provide information to folks new to barefoot. I was a trimmer for 6 years and during that time I specialized in teaching owners, mostly women, to trim. From time to time, I shared an educational handout similar to this post. This month I’ve combined what I’ve learned from Dr. Robert Bowker at several of his clinics with Pete Ramey’s discussion on equine movement in his DVD set, #4 Development of the Hoof and Navicular, Under the Horse. 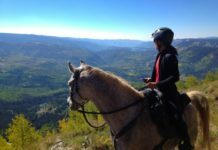 Bowker and many other top notch speakers will be attending The Whole Horse Conference in October 15-16, 2011. Not to be missed! I first met ‘Dr. Bob’ at the EasyCare sponsored conference in Tucson in 2007 (my notes). His credentials, scientific insight and affection for the horse convinced me that his research was well worth following. Honestly, in the horse world there are so many egos spouting nonsense that it is hard to sift the proverbial wheat from the shaft. Because I was a small time trimmer, I needed experts I could rely on. Dr. Bob has PhD in Anatomy and a DVM from University of Pennsylvania and taught at Michigan State Vet School. He continues his research at his Corona Vista Equine Center. Here is where it starts! 5 Hours Old. Feral or Domestic? Impossible to tell. With just the right amount of hoof structure (exposure as well as protection), these future eventing champions appear to float in their buttercup pasture at Chesterland. With ample movement, diet and foot care, their hooves could development correctly, right into adulthood. But somewhere along the line, most of our domestic horses loose their ‘float’. This month I would like to discuss equine movement of the ‘good footed’ versus the ‘bad footed’ horse. These are Dr. Bob’s term and I think they work quite well. As the good footed horse begins to land, heel-first, the back of the foot expands. He may land heel first or flat footed at the walk but at other gaits, he lands heel first. In most cases, a bad footed horse lands toe first to protect his sore back-of-foot. In the traditional world he may have a diagnosis of navicular syndrome, and if there are changes in the bone, navicular disease. Both are misnomers. 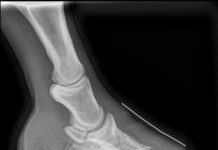 In fact the bone loss of P3, the coffin bone, is worse than that of the navicular. Fix the back of the foot, and you will rehabilitate ‘navicular’. As the horse loads his foot, the heels expand, the sole draws flat and the hoof dramatically expands. A huge vacuum (negative pressure) is created within the capsule. Mechanical engineers at Michigan State actually had a hard time measuring it! Coffin bone to the right, lateral cartilage to the left or the back of the foot. In the domestic horse the lateral cartilages will be half this size and not as thick. Lack of development is due to care, not genetics. You can see and feel the top of the cartilages on your horse. It’s the bulge above the hairline. Blood is literally sucked into the caudal (back) foot by negative pressure. In a good foot, blood is sucked into the entire foot but of particular interest for us is the filling of the mass of specialized blood vessels in the healthy frog, the lateral (side) cartilages, the cartilage floor and the digital cushion. (The cartilage floor, connecting the lateral cartilages, although common in feral horses is rare in domestic. The primary function of the dilated and specialized blood vessels, found only in the foot, is to serve as a cushion for the horse’s foot: the back of the foot and the sole. Just like a top athletic shoe with gel pads, the blood-filled vessels or vasculature dissipate or disperse energy. 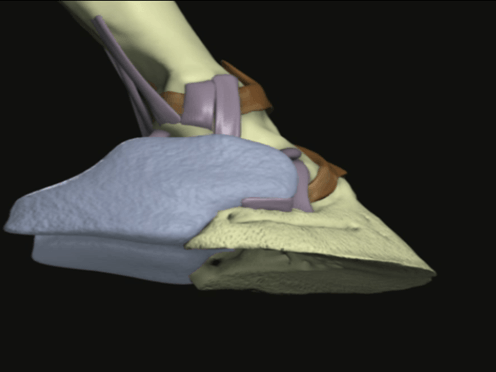 Total energy from impact as well as from vibration pass through the hoof structures (the frog, the digital cushion, the lateral cartilages and the cartilage floor). The better the back-of-foot, the more efficient the energy transfer. Mikayla, a competitive, warmblood mare, had always been barefoot. Her hooves became even better when her owner began to trim her. This is a healthy frog, broad in the back, with a disease-free central sulcas that looks like a thumb print. No doubt there’s a healthy digital cushion above it. (A) How developed is the back-of-foot: Frog, above it the Cartilage Floor, then the Digital Cushion and to either side the Lateral Cartilages. The good foot lands on a healthy, robust frog as pictured above. Pressure-release of the horse’s weight onto the frog develops an increasingly fibrous digital cushion filled with tiny blood vessels as well as proprioceptor nerves which tell the horse where his feet are in space. 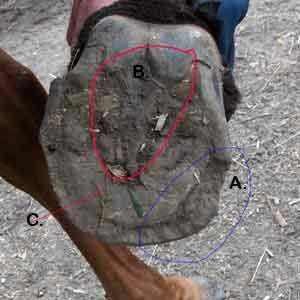 Hoof movement from side to side on uneven ground develops the lateral cartilages and the floor. It’s hard to tell what’s what on this aged Arab mare. 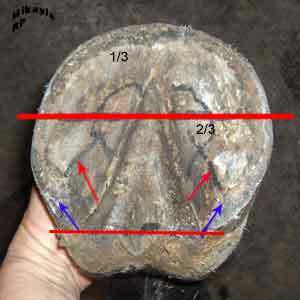 (B) Relative Energy Transfer is effected by hoof structure. The energy transfer will be efficient in a well trimmed foot with adequate back of foot structure. A pasture trim has poor mechanics. So does the horse shod with rubber or metal shoes. The foot will be much less efficient. Energy won’t disperse correctly but rather will travel through the tendons, ligaments and bones of the foot and leg. In part this explains the epidemic of lame domestic horses. Lame in shoes, this pony had an unhealthy frog. My finger on the syringe applicator shows how deep the central sulcas was. Over an inch! (C) And finally, relative energy is dependent upon the ground. On soft surfaces the horse will face less impact force. In padded boots your horse will experience low impact force. The correct balance of exposure and protection, will allow your horse to rehab his feet. ‘Toughing it out’ usually results in the incorrect toe-first landing. Dr. Bob shared this analogy, another view on energy transfer. Imagine the lateral cartilages as large, heated (heat is energy) blocks loaded with tiny tubes (the micro vessels) filled with water. As water passes through the tubes, heat-energy transfers efficiently and correctly from the block to the water in the tubes. The water warms; energy is transferred. All is good. The heated blocks (ie the lateral cartilages) are very thin with just a few tubes (blood vessels) to carry water. Little heat-energy is transferred. In fact the water may not even warm. The heat, or in our horse’s case, energy, must go somewhere, right? It travels to the bones of the foot and leg as well as surrounding connective tissue. This is pathology. Pathology: The conditions and processes of disease. Any deviation from healthy, normal, efficient condition. As the horse’s weight presses down on the entire foot in mid stride, erectile tissues in the sole are stimulated. (This is a new one for me.) They are only stimulated by pressure. No pressure, no function! This is a good reminder to all of us that sound movement, pressure-release, is what develops great feet. At peak impact the blood is pinched off and the pressure then rises dramatically. At full impact, the pastern descends. In a good footed horse, the pastern is stopped by a strong back-of-foot. In a bad footed horse where the back-of-foot is weak and the tendons and ligaments take the hit. When the heels lift, and the toe ‘breaks over’, pressure is released within the foot and the massive force drives blood up the leg. Similar to our legs, as we move, blood travels up the veins through valves. When a valve closes, it prevents the blood from draining down. Horses have an additional mechanism. The veins in the legs pulsate, moving the blood up. Pete Ramey likens equine hemodynamics to an hydraulic pump which I encourage you to read about in Wikipedia if you don’t know how one works. I didn’t! Most of our horses live on uneven ground so they may break over to the right, to the left or at center. Lateral cartilages respond to this movement. The mustang roll enables the horse to move correctly. I routinely rasp a break over on all Easy Care boots from 10:00 to 2:00 by rounding the edge. You could round the entire edge of the boot. Along with the forward momentum of the horse, the suspensory apparatus of the leg and secondarily the ligaments, spring the pastern back. The elastic walls of the hoof spring back to the unexpanded position. The bars play a role too. Most of the mechanics of movement discussed above, drive the foot into expansion. At the end of foot fall, there are a few structures that spring the hoof back together. It’s critical not to rob the horse of these mechanisms with opening cuts at either side of the frog, digging out bars (they do not impact into the foot) and other misguided attempts to redesign the hoof. Apply a natural trim, rehab frog, ride in padded boots if you need them and most horses’ feet will improve dramatically. Heels will decontract naturally (open up) as the frog and internal structures begin to work properly. 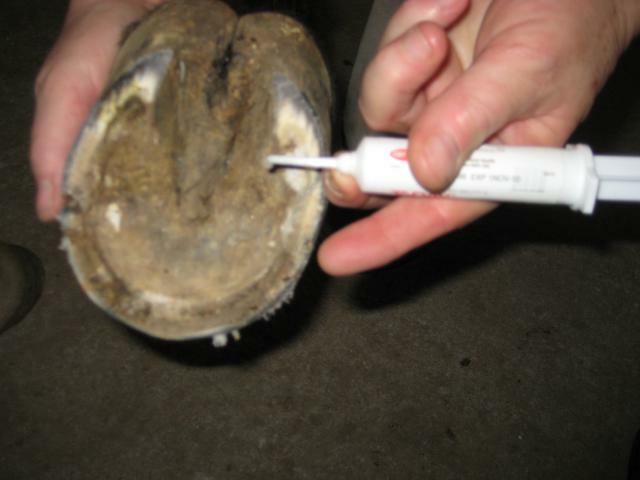 Clean and carefully inspect the bottom of your horse’s feet, daily if possible. Rigorously treat as needed. Make it your mission to have 4 healthy frog. In a wet climate, it’s a job. I know! Find healthy frogs online so you know what they look like. If your horse has unhealthy frogs, leave the heels a little higher to give the frog just the right amount of protection and stimulation. Allow your horse as much sound and varied (hills) movement as possible. No stalling. 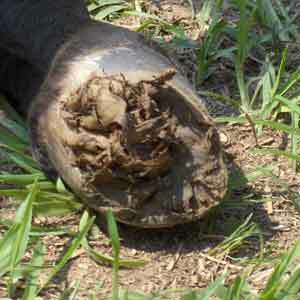 If lame in pasture, use Rx boots with a half inch pad or Equicastes if you can’t remove the boot daily. Ride in padded boots. Of particular concern is padding the frog. Stimulation encourages rehabilitation. 1/4 cup of Gold Bond Powder in the boots will help keep the foot dry. Add 4″ pea gravel to your horse’s standing areas. It’s a hoof miracle cure. Since frogs are critical to equine movement, next month I’ll post some photos of healthy and sick frogs, soaks and treatments. Until then, check out the Equine Frog series in The Horse’s Hoof, by Heiki Bean and Dr. Platz, under Education, Articles. 4SweetFeet.com is my educational site with free trimming videos. Have a visit! Next articleWhy Is The Horse Industry One Of the Slowest To Change?